Recent­ly, Dan Jurak, one of my favourite Edmon­ton-area pho­tog­ra­phers and blog­ger, pub­lished an image on his pho­to blog that remind­ed me so strong­ly of this pho­to­graph of mine tak­en this past sum­mer, that at first I thought they could have been tak­en at the same place. 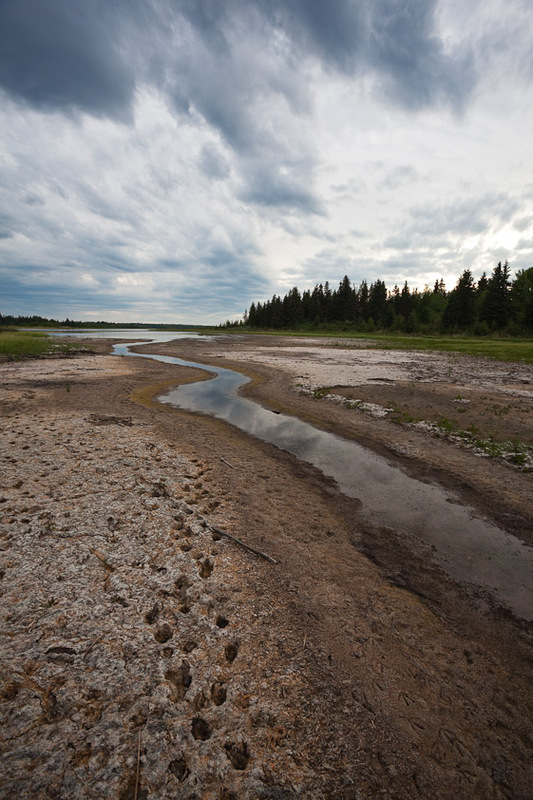 It turns out it’s not the same loca­tion, but sim­i­lar com­po­si­tions and sim­i­lar sub­ject mat­ter — Alberta’s lakeshores are turn­ing to mud­flats (and our mud­flats are turn­ing to grass­lands). I took this pho­to at the Min­is­tik Game Bird Sanc­tu­ary, near the loca­tion of the pho­to in anoth­er recent entry of mine, it’s a dif­fer­ent lake, but the same trend. I like the mood­i­ness of this pho­to, with the some­what threat­en­ing sky and the ani­mal foot­prints reced­ing towards the rem­nant lake.